3 What do I need? The Freifunk Berlin Line-of-Sight visualiser is a tool to see which long-distance wireless connections to existing larger Freifunk sites in Berlin can be expected from a given location. It can augment or sometimes even replace standing on the roof and seeing what is visible from there. 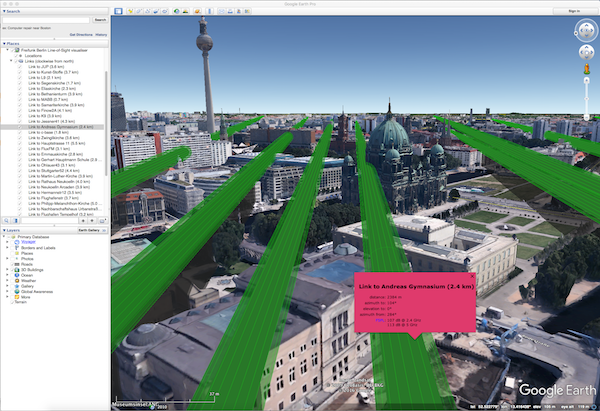 It takes the form of a script that presents custom KML format sight lines over the network to the user running Google Earth Pro, which combines these lines with the Google 3D-buildings layer so the user can easily see if there is something interrupting a line of sight. As can be seen in the image above (click for larger version), some beams from our chosen survey location have no path. The solid beams represent the 5 GHz fresnel zone, the transparent beams around them are the 2.4 GHz zones. Unless you are planning longer-distance connections with directional antenna's to or between Freifunk backbone locations (usually from rooftop to rooftop), this is probably not the tool you want to use. If you want to figure out which of your neighbours might have a freifunk access point, you're likely better off using the OpenWifiMap. It has many more sites in it, and is generated from much more current data. Also, this tool has no idea whether there are antenna's pointed in your direction from any of these sites. You may want to look up the site's wiki page (click the site's name in the balloon), to see more information. Also note that sites may run at different frequencies and at different RF-modes. All this tool does is tell you if there is line of sight. If they haven't built a new building right in the path since the 3D model was created, that is. You'll need a recent version of Google Earth Pro or Google Earth, only available on a Mac or a Windows PC. I know these are not free Operating Systems, nor is Google Earth free software, nor is it using open data. This all suuuuucks, I know. But we need the 3D buildings data that Google has and that is not available using free software. If this freaks you out, simply stop reading and come back when we have open 3D data for terrain, trees and structures in cities and the software to work with it. If you would still like to see what the Line-of-Sight visualiser can do, I recommend you download Google Earth Pro, which is at least free as in beer. Now you make sure you look from straight up (key shortcut: 'U') and zoom in to get as close to the roof that you want to survey as possible. You will notice the camera won't go down more than about 7 meters above the roof, this is normal. Make sure the spot where you want your antenna is in the exact middle of the screen. Then go to the left sidebar, left-click (or Ctrl-click) on the line that says "Freifunk Berlin Line-of-Sight visualiser" and select "Refresh". You will now see green lines from the roof below the middle of your screen to all the Berlin Freifunk locations that have a wiki page and a height over mean sea level (Normal-Null) filled in. If you click on the lines you will see a balloon that shows the azimuth and elevation to the Location as well as the distance. If you look at the scene from the side (using shift-up and shift-down), you'll notice that the lines extend down to the ground so you can see how much clearance there is between the line of sight and any obstacles. You can rotate the camera view with shift-left and shift-right keys. Pressing 'U' reverts to the view from above, while pressing 'N' rotates the image north-up again. Following the lines to different directions you can start unchecking the box in the sidebar for links that go through buildings until you are left with possible links to other Freifunk antenna locations. If you hit "Refresh" on the line that says "Freifunk Berlin Line-of-Sight visualiser" while your camera position is above 250 meters ("eye alt" in bottom right of screen), the lines will disappear, if you refresh below 250 meters, the center of the screen will be the new survey location and new lines are drawn. It's a bit tricky in the beginning, but you'll get the hang of it. If you save the visualiser to "My Places" when asked upon exiting Google Earth Pro, it will always be available to you without having to download and open the KML file again. It contains instructions for a NetworkLink, which loads the KML data from second file, only on refresh, while providing the camera position in the GET variable named VARS. The second file is a PHP script that can be viewed here. The script scrapes this freifunk wiki for the data about the locations and then caches that for up to 12 hours. So if it takes a little longer to load the first time, it is rebuilding its expired location cache. If you changed or added some data about locations in this wiki, you can force this by clicking here. Diese Seite wurde zuletzt am 26. Oktober 2016 um 00:07 Uhr geändert.